Erased reminds me of my own time working in the pizza business. I didn’t deliver the pizzas, though. I was the Shift Leader. I wasn’t there for too long, but I remember it vividly. I managed the phones, created the pies, directed my drivers, took the orders, and tabulated the register. And the cleaning. My gosh, the cleaning. Every nook. Every counter. Every flippin’ bin. While I did not work there for very long, I cleaned so much it felt as if I had antibacterial liquid oozing out of my hands. As an anime, Erased was not pristine, but it certainly ended up being a very clean experience nonetheless. Erased is mostly a plot-driven anime. Character exploration is traded in favor of a more robust tale. It proves this sentiment through the various elements its narrative touts. For instance, “Revival” is the name of Satoru’s ability that has him moving backwards in time to correct some wrong. Pretty cool. But it doesn’t receive a major explanation. Why it only happens to Satoru, where it came from, and so on. The lack of an explanation is perfectly fine. It is not necessary, not important, to have a thorough background of the phenomenon since it simply serves as the catalyst to get the plot going. Indeed, Revival also gives the later inclusion of hand-to-hand memory-fixing a foundation to work off of. I.e., the audience can accept the idea that Satoru regains his memories through Kayo’s baby because they have already been exposed to such unrealistic developments before. 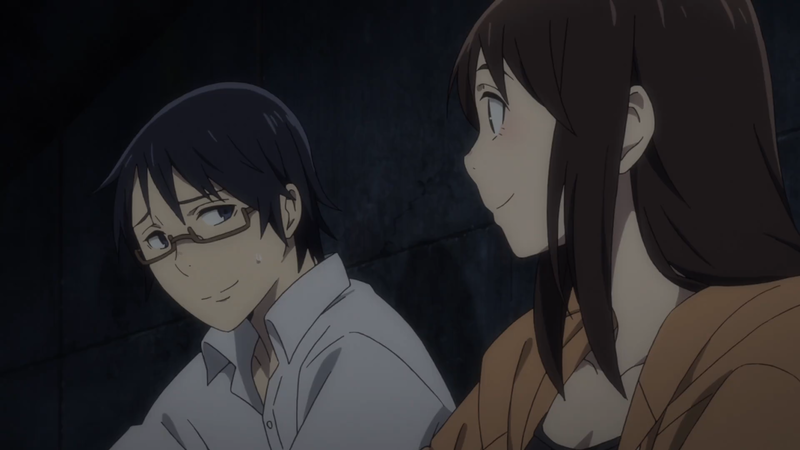 While Erased reaches a happy note, it initially has a lot of drama. Satoru’s first attempt at changing this part of history makes it obvious – because he fails. In hindsight, it seems like the easy move to have him lose then win in the end. But it is even easier to have him succeed outright. But that direction is not realistic. Yes, despite the blue butterflies and psychological magic, the anime follows through on a realistic tale. Child abuse and its ugliness. The misinterpretation of evidence. Feelings of isolation, fear, and anger. As Erased depicts, life is unfortunately filled with misfortune. Intermixed throughout these more abhorrent dealings are the other side of the realistic coin. Namely, happiness. For while life is filled with a lot of evil, it is also filled with a lot of good. A nighttime excursion made magical by dancing animals and an awe-inspiring tree. A birthday with friends, gifts, and smiles. A man’s determination to walk again encouraging a little girl to face her fears. Considering Erased’s emphasis on time and time travel, the ebb and flow of both the good and the evil makes sense. It’s what gives this thriller the pull, the engagement necessary for its audience. To get them invested in the directions and the characters and the outcomes. An argument against the show’s progression is in its predictability. While the anime attempts to throw off the trail here and there, it is not difficult to guess who the ultimate villain is when one of them is too obvious (the mother) and the other would not make sense narratively (Satoru’s teenaged friend who was originally pinned as the culprit). But predictability does not automatically mean the narrative has issues. Indeed, the anime should be logical. And it is. The school setting, the constant interaction with the antagonist, and the various tidbits of information should (and do) point to Yashiro the teacher as one would expect. 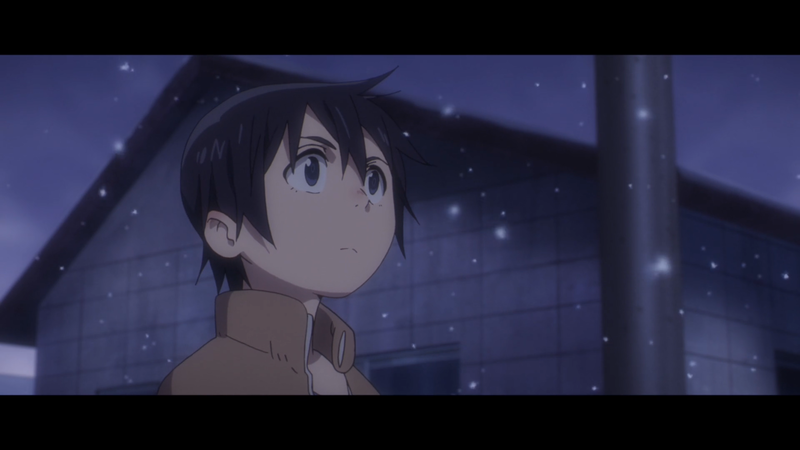 Predictable or no, Erased does well in building suspense. Throwing out a feint with Yashiro’s car candy. Satoru and Kayo nearly being found in the derelict bus. Flames engulfing Airi’s house. Many of these scenes are interlaced with the happier and eviler moments, adding further to that thrilling feel. The entire season also contains many subtler narrative techniques. The time-travel aspect symbolizes the idea that in order to move forward one has to first move back. Parallels between different stages of life – childhood, teenager, adulthood – demonstrate that human nature remains relatively the same. A constant theme on passivity leading to inopportunity. In other words, beyond the anime’s superficial events, substantive material can easily be found. Despite all of the praise, Erased arguably has a huge flaw. It does not deal with the time travel or the mystery or the symbolism. Its biggest problem is something slightly more sinister: Kayo’s conclusion. From episode two to episode nine, the anime places an immense amount of focus on Satoru and Kayo’s relationship. Narratively, their connection in the past directly equates to Satoru’s connections in the present. In short, the anime considers their events, their time together, to be of the utmost importance. As such, it makes very little sense to squander this relationship that they built together. A relationship emphasized for almost the entirety of the season. 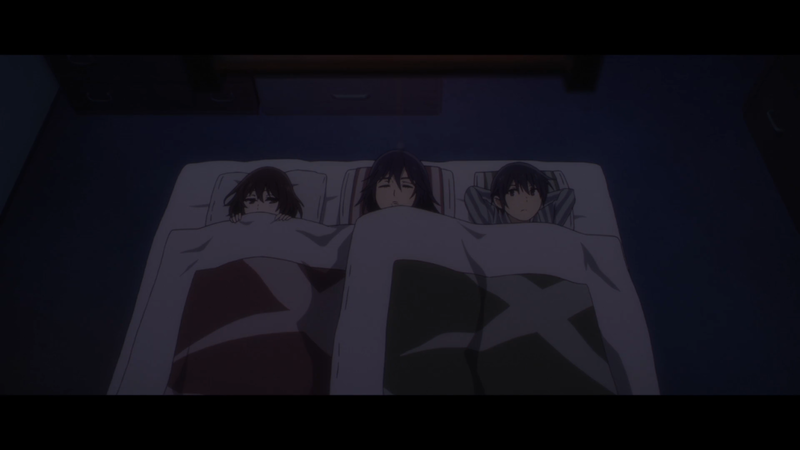 In one fell swoop, the anime destroys their established connection: no reciprocation, no rallying, and certainly no romance. The anime’s attempt to explain this development is feeble at best and insulting at worst. Satoru claims that his fate is his own when Kayo reveals her guilt. The line is extremely hypocritical. Not only did Satoru literally change her fate and the fate of many others, but also those close to him already affected his fate (for the better). Without a doubt, this direction is a debatable one (if the community’s reaction is anything to go off of). Included in the debate is whether or not the outcome ruined the narrative. While it didn’t demolish everything that Erased set out to showcase, it certainly ended up being a negative on an otherwise mostly positive tale. Erased continues to perform well with its art and animation, too. On an artistic level, the anime incorporates many different techniques. It paints its visuals with somber colors: Lots of greys and dull blues set the mood well. 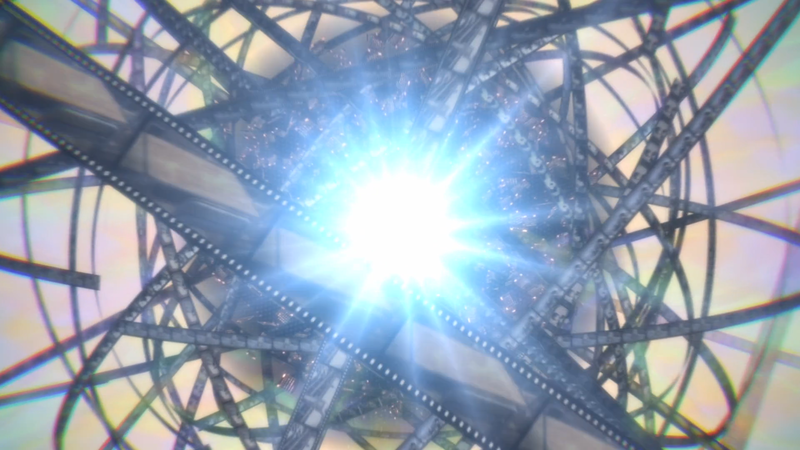 Widescreen segments go along with the emphasis on presenting Satoru’s mind and memories as a movie reel. Cinematography, lighting, and shot composition likewise see care. The visuals for the OP and the ED are also interesting. Removing Satoru in episode ten plays on the erasure motif, and the ED goes extremely stylistic in its depictions, making the viewer unsure what to believe and therefore playing on a major theme of the anime (discussed later). The character designs, while not flashy, are crisp in their presentation and detailed in their depiction. Satoru’s glasses and lanky body frame him as the underdog without completely turning him into a weakling. Sachiko’s lips are large, but her design shows where Satoru got some of his own genetics. And the different outfits and body types of the other characters add to the realistic portrayal. 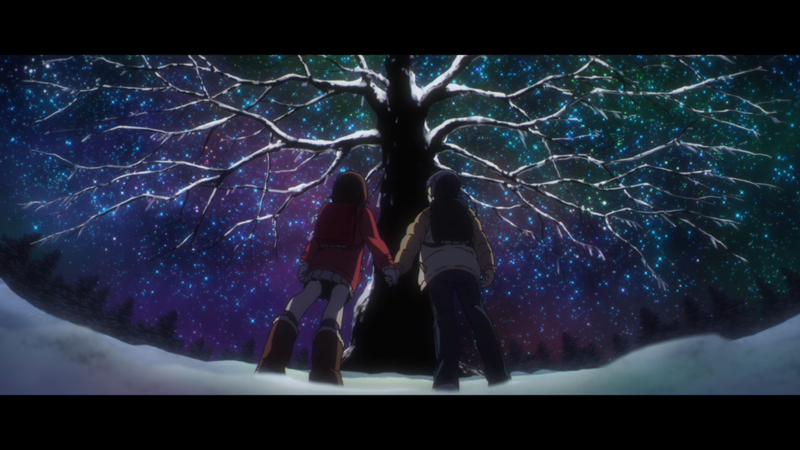 Admittedly, the background art for Erased is nothing overly impressive. Mostly due to the setting being a suburb. A school, some houses, and the occasional underside of a bridge do not exactly scream beautiful. But because of the moderate detail for the locations, a nice amount of attention is given to the actual animation. Faces express smiles, shock, and concern, and characters either tap their fingers or punch their fellow employees in the face. Altogether, the animation levels remain relatively high, keeping the show as dynamic as the events therein. Arguably speaking, Erased’s weakest aspect is its cast. That’s not to say that they are awful. Far from it. They just do not stand as strong when compared to many other parts of the anime. Take, for instance, Yashiro. Yashiro is not a well-written character. His background consists of murdering hamsters and chasing after invisible strings attached to kids’ skulls. I.e., he is not a strong villain because his motivations do not extend beyond the cruel and the insane. To be fair, the mystery motif prevents the anime from delving into Yashiro’s character because (perhaps obviously) the show would fail to be mysterious. Even so, Satoru spouting in the final episode that he looked up to Yashiro as a father figure is a weak attempt at humanizing the vile man since he rarely acted as such. Speaking of Satoru, he does better overall. Satoru goes from being a pizza delivery boy who lives with his mom to being a successful manga artist. Obviously, getting there required a lot of work. It required a lot of help, too. When Satoru goes back to being a kid in elementary school, he discovers that his loneliness as an adult manifested from this period. Rather than be himself, he put up a faux persona, trying to appeal to others in a self-disingenuous manner. Him purposefully losing at the ice-skating race is evidence enough. Him as an adult impersonating himself as a child accentuates this main conflict of his. Without Satoru being Satoru and not Satoru, he would have never become Satoru. Which is weird, but that’s what time travel introduces. Regardless, he slowly reaches out. He befriends Kayo. He confides in Kenya. He leverages Sachiko, his mom, to do what his kid self could not. In essence, he surrounds himself with loved ones. Not through some fake front but rather through personal connections. The time Satoru spends with his newfound friends, both old and new, affects him. It gives him the drive to pursue a passion – in this case saving Kayo and ultimately changing the future. And the support he receives, such as his mother’s meals, Airi’s aid, and Kayo literally becoming a lawyer for Satoru’s sake, demonstrates that the person he was then (which is really a different now) no longer reflects who he is today. In the end, he gets compensated for the sacrifices he made in the same way that his sacrifices compensated everybody else. He finally becomes a successful manga artist. Revival goes away. And he reunites with Airi as one last hoorah. Satoru’s character is by no means excellent, but, clearly, his experiences changed him. Kayo’s change is more tangible. Not just in the scars and bruises that she carries both on her body and on her mind. No. It’s in the people she surrounds herself with. Or rather, in the friends that she gains thanks to Satoru’s intervention. Where she was once lonely, distanced from her classmates and life in general (obviously not of her own accord), she finds comfort. She finds safety. She finds love in the relationships she begins to share. From being defended after a mean prank to a trip to the local museum, she no longer has to worry about the words in her journal coming true. While Erased unfortunately does not draw parallels between her motherhood and that of her mother, her baby and her happiness makes it clear that she, too, has changed for the better. Yet the best character is neither Satoru nor Kayo. Arguably, that distinction goes to Sachiko. Not because she develops as a person. That’s not her role. Instead, she acts as a supporting character in every sense of the phrase. She gives Satoru words of wisdom here and there. She supports young Satoru’s vision. She cared for older Satoru’s comatose body for fifteen straight years. Not to mention protecting Kayo, speaking with neighbors, and generally having an air of intelligence about her. She’s not just a fantastic mother but simply a wonderful person right to her very core – even if she may be a “demon” on occasion. Airi is perhaps the only other notable cast member worth discussing. The anime tries to make her more relevant through a bit of backstory involving her father and the accusations against him. But it mostly falls flat due to how it comes off as last-ditch rather than well-executed. Nevertheless, her character is the first major indicator of one of the anime’s most important themes: believing. Whether they realize it or not, people are constantly believing. They believe in getting those lucky lottery tickets. They believe in imaginary cultural figures. They believe in dreams and goals. 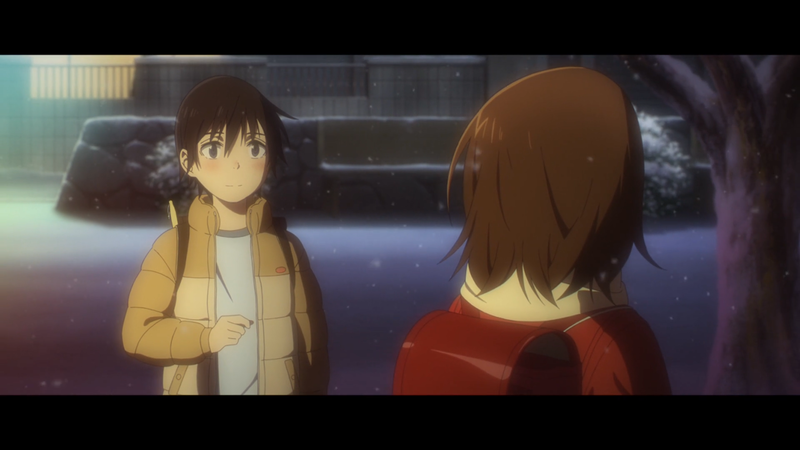 For the characters of Erased, their belief is mostly for others. More specifically, belief in Satoru. Airi believes in Satoru – not because she “can” because she wants to for her own sake. Sachiko believes in Satoru, too. As any good mother would. Even Yashiro believes in Satoru, but for a different reason. Yashiro believes in Satoru’s “final” words as he plunged into the icy water because Yashiro had nothing else. Kayo and Kenya and those close to Satoru believe in him as well. As for Satoru, he not only believes in the others – for their kindness and helpfulness and steadfastness. But also he believes in himself. He believes in his ability to bring about change, to bring about a new destiny. Believing in something, be it some numbers or a person, requires more than just thinking. It requires passion and determination. And when that belief is held, honestly and truthfully held, it is impossible to take away. What’s being believed in can no longer vanish; it can no longer be erased. Perhaps surprisingly, Erased excels the most in the sound department. The wonderful voice acting deserves praise first. While everyone does a nice job, it is the newcomers for the main protagonist that steal the spotlight. Shinnosuke Mitsushima as Satoru, in his first ever role, nails a languid tone, fitting the style and personality of the hero more than well. Tao Tsuchiya as the younger Satoru, in her first ever role, likewise impresses, making the child come to life. And when the anime intermixed their voices from time to time, it only made the experience that much more enthralling. The opening track continues proving the show’s sound strength. It’s catchy, taking advantage of a plucking guitar and a simple beat. The tone matches the believing theme, filling the listener with confidence. And the leveled singing from the vocalist ties the whole track together. Yet even stronger than the OP is the ending track. While technically not as catchy, the ED is beautiful in its presentation. The piece starts by combining otherworldly sound-effects with grounded instrumental work that then gives way to a resounding composition. The singer’s range then instills so much emotion. And as the tone transitions between somewhat somber, intense, and fully hopeful, the ED makes you believe in its beauty. And while the rest of the original soundtrack is not the most impressive – a melancholic piano piece and atmospheric, adrenaline-rushing tracks – the other areas more than make up for any averageness that the OST encounters. I had a fun time following this one. It was one of the only shows I kept up with weekly back during its season of anime. I had to know that Kayo was safe, the bad guy was going to get caught, and that Satoru would be rewarded in the end. Granted, I had to put the show on hiatus for a while here, but I am happy that at least those three outcomes occurred. What I was not happy with was the whole Kayo debacle. I am a romance-centric man through and through, so the anime teasing this route with her and Satoru as kids and then completely throwing that in my face later on made me upset to say the least. At the minimum, the implied relationship that he will share with Airi took away some of the stinging from earlier. Beyond the romance, I liked the smaller bits of comedy. Satoru calling his mother a “youkai” and Kayo (and sometimes Airi) asking him if he is stupid made me laugh without taking away from the suspense that the drama so regularly created. I also appreciated the smaller callbacks. Satoru using his fingers as a rectangle for viewing in the same way that Airi did (under the same bridge no less), naming the baby “Mirai” or “future,” and Misato raising funds as opposed to “stealing” them. And despite the show not being character-driven, I liked the cast, too. Kenya and Airi believing in Satoru, Kayo slowly becoming friends with the others, and Sachiko being an amazing mother (yet still not as amazing as my mother) were characteristics that made these characters ones that I rooted for. My only wish with the anime was it having more of a twist with the Revival aspect. I was betting on the idea that Kenya (or anyone else) was connected to the power, but it truly ended up as just a means to get the tale rolling. Erased stands strong. While the narrative makes a questionable decision near the end and not all of the characters are exactly worthwhile, the anime finds strength elsewhere. Emotional events. A thematic presence for its characters. And sound-work that easily impresses. Taken together, the anime is one pizza worth reordering for delivery.